O-Grab Mini is an automatic phone mount built by Sinjimoru, a company that has been creating new and innovative phone mounts based on passion for phone accessories and technical know-how for over 10 years. The holder, which can recognize objects through an infrared sensor, can be used easily even while driving. It will hold your phone securely in place at all times, and it won’t open unless you want it, even if the power turns off. The user-friendly design creates a comfortable and safe driving environment, so you can focus on driving without ever worrying about your phone. Meet our O-Grab Mini. O-Grab Mini is a motorized phone mount which can recognize approaching objects through cutting-edge infrared technology. Even if a system error occurs or the power supply is cut off, the holder will not open and drop your phone. With only a slight touch you can open the holder and remove your phone with ease, no need to press buttons. The holder is 20mm deep and features pads that are thicker towards the outside, so your phone won’t fall out of the mount! There are three types of mounting attachments that can be used in connection with the O-Grab Mini body. If you prefer a different attachment method than the dashboard 3M tape type (basic), then you can separately purchase one of the other options below. This type of attachment can be placed on the car dashboard as well as on the windows. Since it is attached through a gel pad, it can be re-positioned as often as you want. This type of attachment is for the cars air vents. It can be adjusted to the thickness of the air vent and can be clipped on easily. Thanks to the strong material, your phone will not be shaking while driving. 1. Clean the center fascia or dashboard with a wet wipe and let it dry completely before attaching the mount. 2. Remove the protective film from the 3M tape that is on the back of the mount. 3. Attach the mount to the desired spot. 1. When you hold your smartphone close to the mount, the infrared sensor recognizes it and opens the sides of the mount automatically. 2. When the smartphone is placed on the mount, it will close its sides automatically and lock them in place. 1. 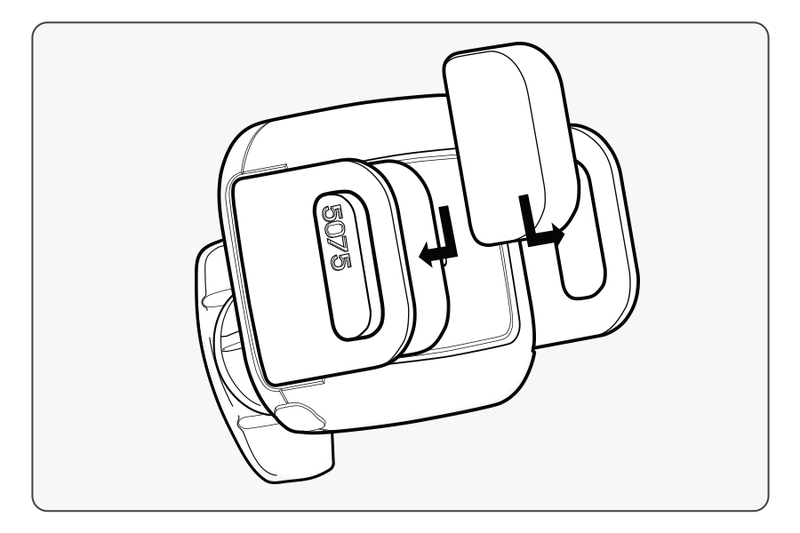 Touch the capacitive touch sensor on the lower left side of the mount to open the locked holder. 2. You can now remove your smartphone easily. 1. Two sizes of rubber pads are available to accommodate both small and large smartphones. 2. Remove the current rubber pad by pushing it hard from the outside. 3. Place the rubber pad you want to use into the empty spots from the inside out and use the mount as usual. 1. Contact with water or other liquids can cause errors. 2. Make sure to remove the power supply (cable) when cleaning the main body. 4. The infrared rays that pass through the infrared light emitting part of the motion-sensitive IR sensor are reflected by white or bright colors, so the sensor will be more sensitive to brightly colored objects. On the other hand, dark objects absorb light, which can make the sensor less sensitive. 5. The sensor recognition may cause intermittent malfunctions in the way the motor operates. However, if a malfunction occurs, the limit switch prevents the holder from opening, preventing the smartphone from falling down. - If the power supply is suddenly interrupted, the mount holds on to the smartphone. Once the power comes back, the smartphone can be removed by touching the button at the lower left corner. - The mount holds on to the smartphone. The smartphone can be removed by touching the button at the lower left corner. - Even if the power supply is interrupted, the inner spring makes sure the mount will not open up. - Even after removing a phone with force, the holder will remain in the closed position. It can be activated by bringing an object close to the IR sensor or by touching the button at the lower left corner.